We also offer media destruction, such as hard drives, tapes, CDs/DVDs, and diskettes. Peña’s Disposal Countywide Shredding is certified by the National Association for Information Destruction (NAID). NAID AAA Certification Program is a voluntary program we participate in to display to our customers that protection of their confidential information is our priority! It means that we meet the laws and regulations required for protection of our customer’s confidential information. Simply said – we adhere to the FACTA Final Disposal Rule and HIPAA Security Rule. And, our shredding technicians have been skillfully trained on how to properly handle customer information. 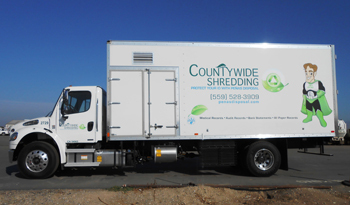 Whether you are doing a purge, need us on-call, or need shredding on a schedule – we are the company for you! If you are looking for scheduled shredding on a weekly, monthly or quarterly basis – we will work with you to design a solution that best suits your business needs. We have lockable shredding carts in 32, 33 or 64 gallon size to select from – you pick the size that works best for your environment. You also have the option of bringing your paper records to our Cutler facility – just call us in advance to make sure our mobile shredding truck is onsite. For all shreds, customer must remove all non-shredding material, such as: x-ray film, film of any kind, metal clips, binder clips, plastic folders, plastic sheet protectors, and file hangers.